Olga Y. Tsagarelli was born in 1972 to the musiciants' family. 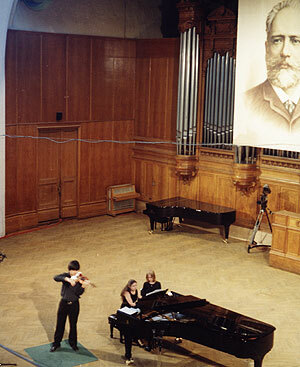 In 1990 she finished the Music School under the Kazan State Conservatory, Piano faculty. When at school she became a prizewinner of several junior competitions and toured Russia and Tatarstan with the Tatarstan State Academic Orchestra and the Abyazov's Chamber Orchestra "La Primavera".(photo). In 1995 she graduated from the Kazan State Conservatory (proff. I. Girfanov). In her conservatory years she became a prizewinner of the student concertmasters competition and was awarded the diploma "the best concertmaster" at the Regional Young Strings Players Competition (city of Kazan, 1992). 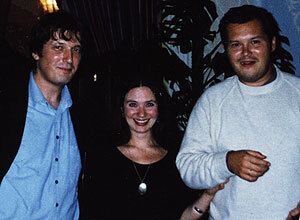 In 1995-1997 she was an assistant trainee at the Tchaikovsky Moscow State Conservatory, Piano faculty, proff. G. Mirvis's group. Since 1998 she has been working as a tutor of a chamber ensemble and a concertmaster in the Central Music School under the Moscow State Conservatory (MSC). When at the MSC she contribuded a great deal to V. Spivakov's and M. Rostropovich's funds. 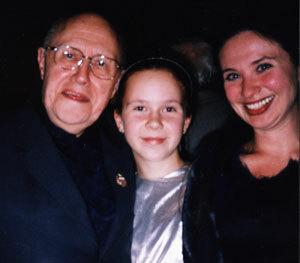 M. Rostropovich highly appraised Tsagarelli's performance, particularly her ensemble playing intuition, musicianship, fine sounding and artistic appeal. (photo). 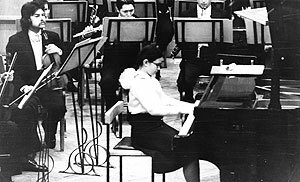 In the same year she took part in T. Khrennikov's creative jubilee, where she performed his celo sonata together with a gifted young celo player S. Antonov. 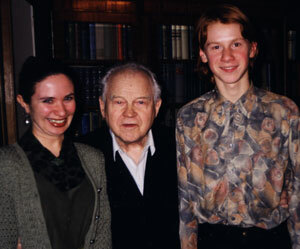 Khrennikov spoke very highly of the young musicians' performance. His words were: " Olga and Sergey are admirably talented young people... Olga is an excellent pianist, bright, emotional, very gifted." 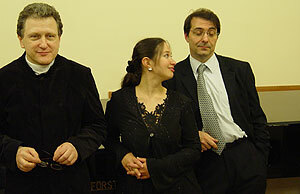 During her teamplay with Khrennikov Tsagarelli performed a great number of his compisitions, including the piano translation of Khrennikov's ballet "The Captain's Daughter". On Khrennikov's request she was the first performer of this composition. (photo). In the same year she was awarded diplomas "The best concertmaster" at the International young strings players competition in the city of Nizhny Novgorod and at the II-nd International Chamber Music Festival "Russian Spring" in Moscow. Since 2004 she has been working as a concertmaster in the MSC (proff. A. Vinnizkiy's group). In that year she was awarded diploma "The best concertmaster" at the II-nd International violinist competition "Eurasia-2004" in the city of Almaty, Kazakhstan. (photo). As an ensemblist, O. Tsagarelli teams up with many famous musicians, such as A. Vinnizkiy, K. Rodin, A. Rudin (photo). as well as with young talented musicians, prizewinners of prestigious international competitions - N.Sachenko, V.Gutsul etc.